I made it to the Stay Gallery for the last few minutes of the historical photo exhibit. 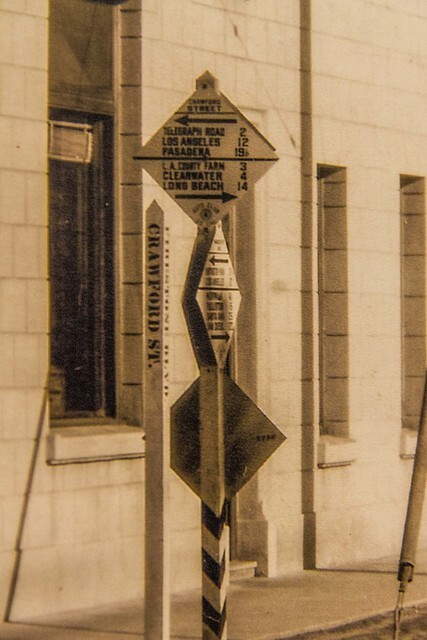 This photo is zoomed in on a sign that was once found on the corner of Crawford and Firestone Blvd. The sign gives the distance to a number of cities and landmarks nearby. It lists the LA county farm (which used to be the poor farm, located on the south campus of Rancho Los Amigos) as well as a place called Clearwater. While it listed Clearwater as only 4 miles away, I was unable to identify where this could be. I wonder if anyone knows what Clearwater used to be.